I did a blog post about Curlformers MONTHS ago but here is another awesome YouTube tutorial from one of my favorite Vloggers–Brandi! 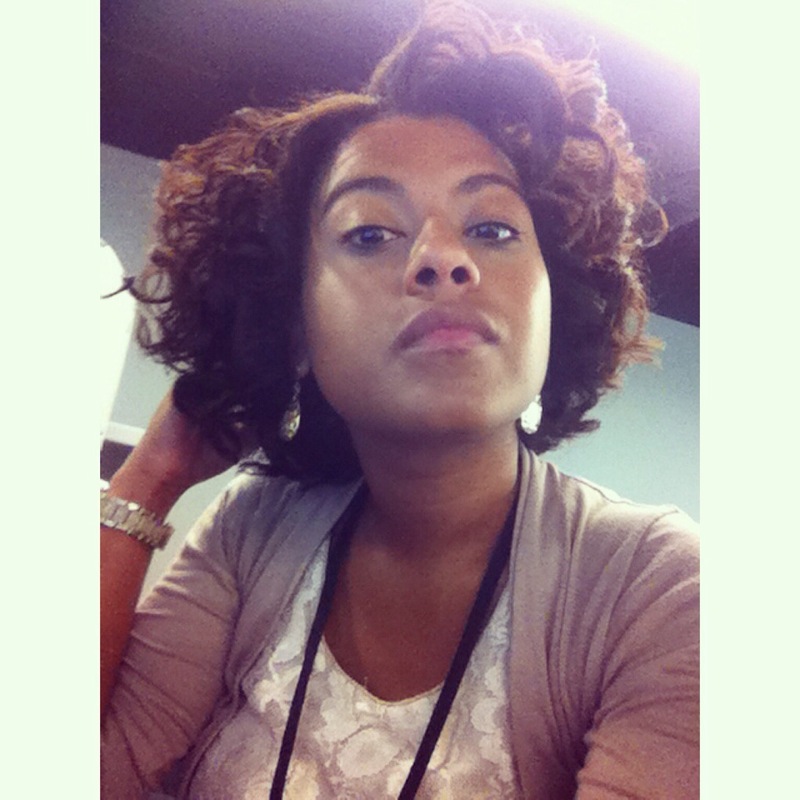 Below are my results with the curlformers! 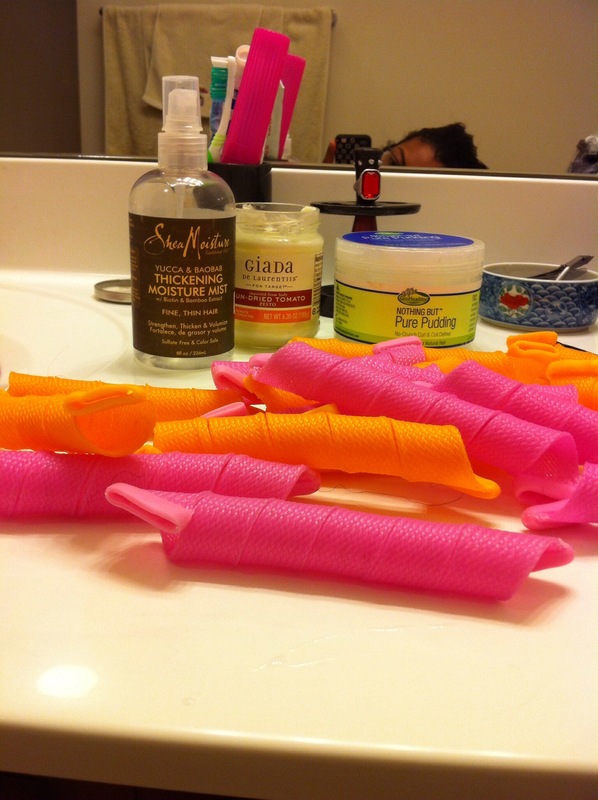 I should start this blog off by saying I have a real love/hate relationship with Curl Formers! Why? Let me explain. 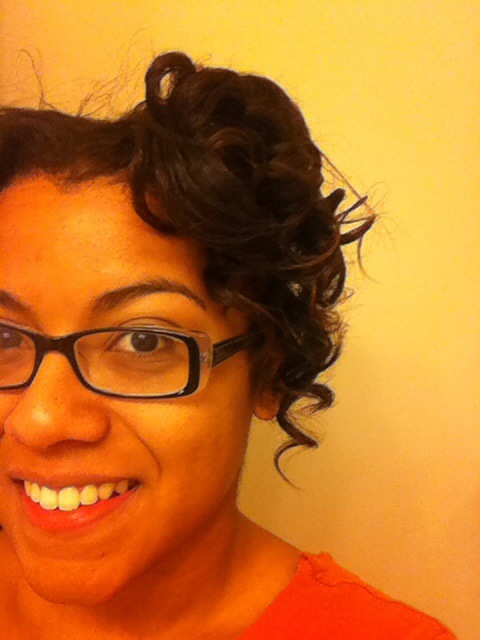 Curlformers do a good job of giving you a perfectly spiraled Shirley Temple like curl. However, they are expensive (6 for $15 at Sally’s) and can pull the hair if you aren’t careful. When I do my curlformers, I have a tendency to pull my hair when trying to get my hair to slide through the opening of the curlformer. Even when I try to get the smallest piece of hair through, hold open the top of the curlformer AND twist my hair slighty at the root…it’s still a struggle. Again, however, I will say that when they do work they do deliver! 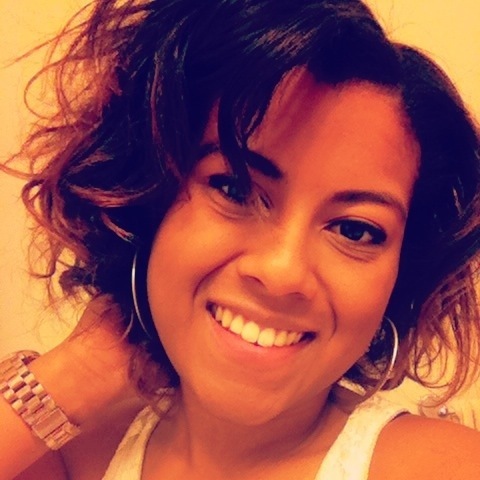 Here is an article that explains the use of a Curlformer and even contains a YouTube video that shows how she applied and styled her hair. Additionally here is another YouTube video, for my naturalistas, that does a great step by step tutorial and style. 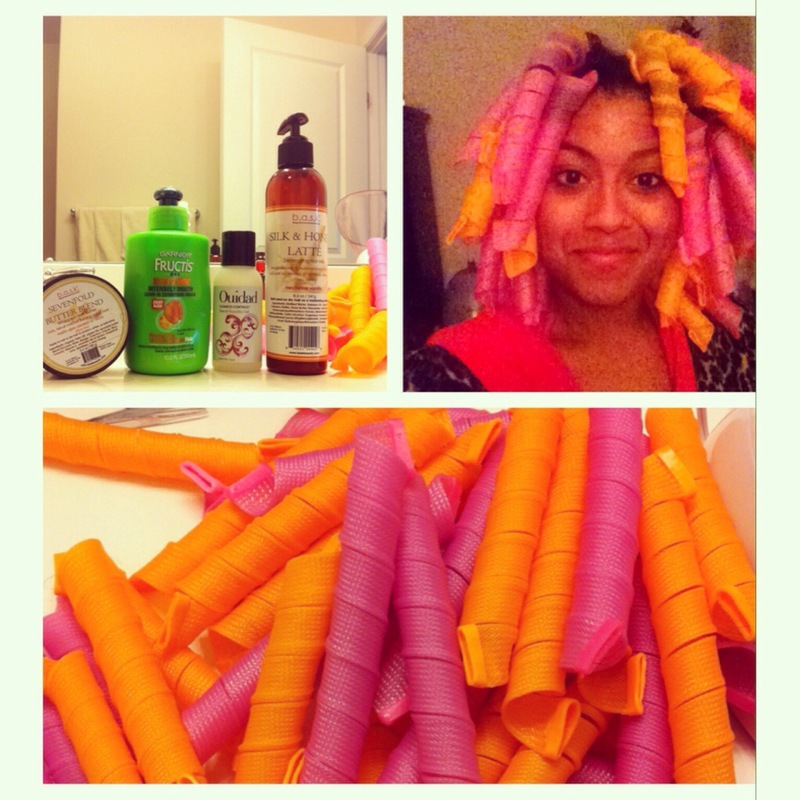 When I use my curlformers, I like to start with dry hair. Most people prefer wet, freshly washed, hair but I have yet to try this because I have yet to perfect the act of putting on my curlformers. Wet hair would make the struggle worse. So, for now, dry hair it is. I start with parting my hair into four sections, using butterfly clips. When I focus on one section, I use my spray bottle filled with SheaMoisture Yucca & Baobab Thickening Moisture Mist to dampen my hair. I then use my own DIY leave in conditioner/sealant to my hair followed by Nothing But Pure Pudding. I also like to use Nexxus Pro Mend Split End Binding Leave In Creme on my ends. This part of your hair is the most fragile and it’s important to make sure that your ends are well moisturized, before you put the curlformer on, to ensure a nice smooth curl when you take them out . From this point on, I’ll allow the previously mentioned YouTube videos to explain because it does a way better job than I can!! I will share some tips, however, that I find most helpful. *If starting on wet hair, I recommend using a bonnet dryer to help dry and set your curls. If starting on dry hair, no bonnet dryer is necessary. *If your curls come out too tight or curly, seperate them as the women in the YouTube video do and allow them to fall a bit before applying any hair spray. *My favorite finishing sprays to use are Marc Anthony’s Oil of Morocco Argan Oil spray and Proclaim Olive Moisturizing Oil Sheen Spray. Both of these have been reviewed in the Hairspray section of my blog. 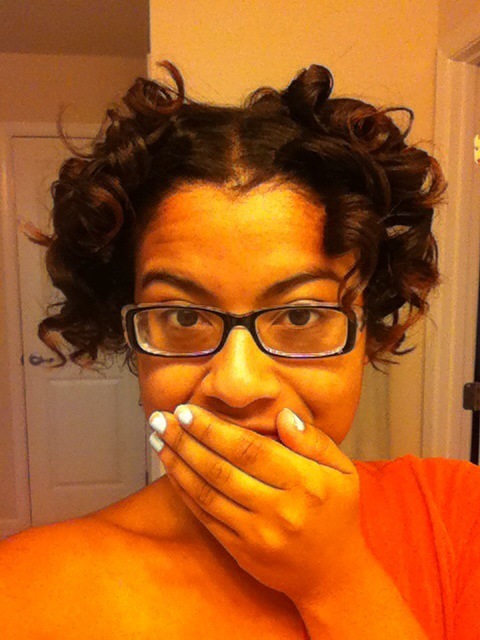 Below are pictures of my hair in curlformers. Only the last picture is of my whole head done with the Curlformers, after I let them fall a bit, taken a few months ago. 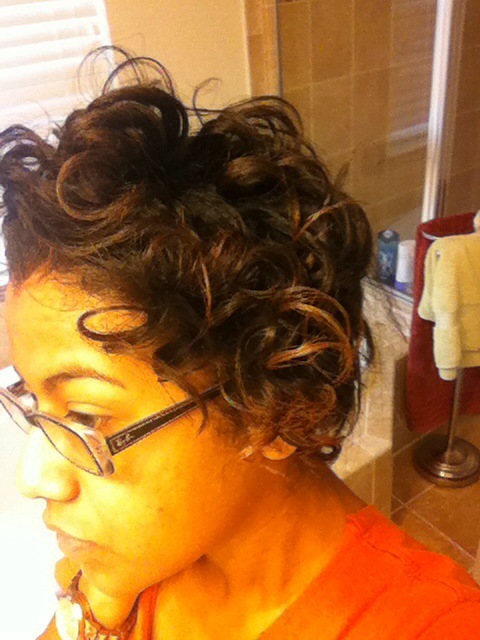 The first pictures are only the top two sections of my hair done with the curlformers. 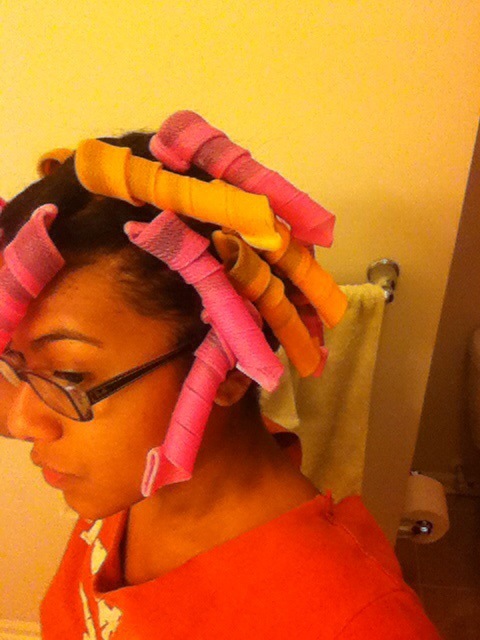 The very first picture shows what I used on my hair before applying the curlformers. The second picture is the top left section of my hair, after applying the curlformers. The third picture is the top two sections of my hair, immediately after I took down my curlformers. 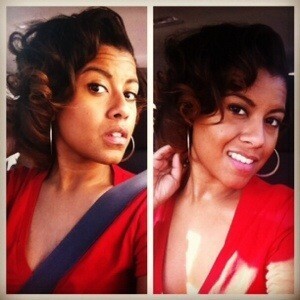 The fourth picture is what my hair looked like after I separated the curls. The fifth picture is my hair, pinned up in the back, with the top left section of curls showing after the fell a bit. Finalllly, the last picture, as previously mentioned is my whole head done with the Curlformers after the curls fell a bit.